The Hesse elections were the last straw. Even though it looks like the ruling Christian Democratic Union – Greens coalition in this Bundesland (federal state) in central Germany will remain in power, Chancellor Angela Merkel’s CDU received just 27% of the votes in Sunday’s state elections. Following a disastrous result for the Christian Social Union (the CDU’s Bavarian sister party) in state elections two weeks ago and a general weakening in support for her party in the polls, Merkel will now relinquish the party leadership but plans to stay on as Germany’s chancellor. 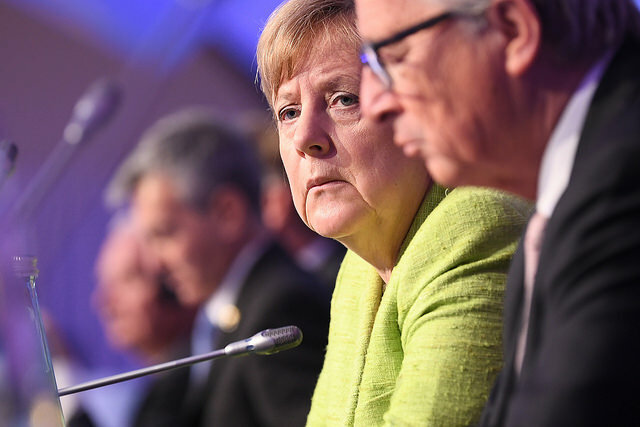 At a press conference on Monday, Merkel conceded that she had traditionally opposed splitting the two posts of party leader and chancellor, believing that they should be held by the same person. But, having weighed up the pros and cons, she said she now feels it’s an acceptable compromise, even though she acknowledges that it’s a ‘gamble ’. To the surprise of many, she announced several steps  to withdraw from power. After 18 years as CDU leader—the first woman to hold the post—she now won’t run for re-election as head of the party when it holds its convention in early December. She also called for a new leadership team to be put in place after her departure, which would be charged with preparing a new party platform. And she declared that she won’t seek another term as chancellor. A number of CDU politicians are already positioning themselves to replace Merkel as party leader. They include Friedrich Merz, an economic conservative and social liberal who served as chair and deputy chair of the CDU/CSU parliamentary group in the late 1990s and early 2000s. He left party and general politics in 2009 citing differences over the CDU’s direction. Another contestant showing interest is Jens Spahn, currently health minister and one of Merkel’s strongest critics within the CDU. At 38 years of age, he would bring both a generational and policy overhaul. Spahn belongs to the conservative wing of the CDU and could secure support from those who oppose the course Merkel has taken. Armin Laschet, the premier of North Rhine-Westphalia and another potential candidate for the leadership, has often expressed support for Merkel’s decisions. The only woman who’s been named as a potential successor is Annegret Kramp-Karrenbauer. She is the former premier of the Saarland, whom Merkel had asked to become secretary-general of the CDU in March, a move seen by many as a sign that Merkel was positioning Kramp-Karrenbauer to be a potential successor. Merkel said that she’s prepared to serve out the rest of her term as chancellor, which finishes in 2021. In the next federal elections, due to be held that year, she won’t stand as the CDU’s candidate for chancellor. She also won’t run again for a seat in the Bundestag, where she has served as an MP since December 1990, having been elected in the first poll held after German reunification. Merkel served as minister for women and youth from 1991 to 1994 and as environment, nature conservation and nuclear safety minister before taking on the position of CDU secretary-general, which she held from 1998 to 2000. She took over from Gerhard Schröder to become the first female chancellor of Germany in 2005. On Monday, she clearly stated that she wouldn’t seek any other political office after 2021, silencing—for now—speculation that she could head for Brussels to take on a position in the European Union, a step taken by many politicians across Europe who have left office in their own countries. In a conversation in 1998 , Merkel said she believes that it’s easier for women to quit politics anytime because they remain more connected to everyday life and are less afraid to do so than men. She also said that she wanted to be remembered as someone who changed things, whose name was connected to certain achievements, and who hadn’t lost her connection to reality. Merkel made history not only by becoming Germany’s first female chancellor, but also by taking several landmark decisions that affected the country’s future: phasing out nuclear power after the Fukushima disaster; leading European austerity policies following the global financial crisis; taking a stronger foreign policy stand after Russia’s illegal annexation of Crimea; and refusing to close the borders during the height of the migration crisis. During her long tenure in politics, she has been voted the most powerful woman in the world on numerous occasions. The announcement on Monday is typical of Merkel’s leadership style. Always a pragmatist, she has done what she believes is right. Now, she has taken responsibility for the situation the CDU and CSU have found themselves in—unlike some of her male colleagues. And, unlike her predecessors, she has chosen when and how she will exit the political stage. Jacqueline Westermann is a researcher at ASPI. Image courtesy of the European People’s Party on Flickr.